In the Mushroom Kingdom, one can't be too distracted by sibling rivalries. It may be an amazing world full of magic and wonder, but there are also treacherous monsters and bottomless pits around every corner! Brothers have to work together if they expect to save the princess and not get clobbered by whatever danger they run into. So even though Mario is the older of the Mario Brothers, Luigi still gets his fair share of the glory! When your little one is dressing up for their own Mushroom Kingdom adventure, wearing this official Luigi Child Accessory Kit will help them look just like the younger of the Super Mario Bros! 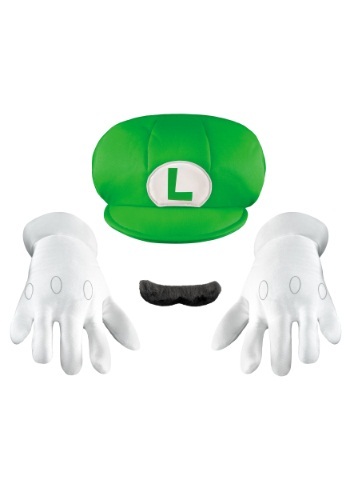 The soft foam gloves and green plumber's cap are modeled after the ones worn by Luigi in the classic Nintendo game series, and the upturned foam mustache sticks under your kiddo's nose. And mama mia, they can have even more fun teaming up with a buddy in a Mario accessory kit!